There are 4 or 5 processes that do more-or-less the same thing in slightly different ways. Each was designed with a different purpose in mind, but that doesn't mean they can't be used for other purposes the designers hadn't considered. Bioenergy, waste-to-energy, renewable energy storage as synthetic natural gas, biogas and synthetic natural gas from coal are different ways of doing the same thing. Synthetic natural gas can be used to store energy, to generate electricity on demand, and as feedstock in manufacturing processes. Synthetic natural gas can also be manufactured for export in the form of LNG. It can be made from 100 percent renewable energy, 100 percent fossil fuel energy, or some combination of both renewable and fossil energy. This allows a transition to a 100 percent renewable energy future, achieving the above requirement statement: ensuring reliable, affordable and clean energy. Photosynthesis by plants and algae to create biomass that methanogenic bacteria convert to methane is one way of doing this with solar energy. Waste-to-energy can use methanogenic bacteria to produce methane using the solar energy embedded in the waste. Electrolysis of water to produce hydrogen that is reacted with carbon dioxide to make methane is another way of doing this with solar PV systems and wind turbines. Biomass can be converted to methane in high temperature superheated water reactors. The thermal energy to do this can be from concentrated solar thermal energy, or from reaction with either oxygen or hydrogen created by electrolysis of water. Biomass can be converted to methane in very high temperature gasifiers that create carbon monoxide and hydrogen that is reacted in a separate step to create methane. The energy for this high temperature process can be obtained by burning a portion of the feedstock in air. In each of the above processes that use biomass to produce methane, coal can be used in place of some or all of biomass. When there is sufficient solar PV and wind turbine generating capacity, hydrogen can be produced whenever electricity supply exceeds demand. This hydrogen can be reacted with carbon dioxide to make methane for generating electricity whenever demand exceeds the supply. With sufficient renewable energy generating capacity, synthetic natural gas can be manufactured for export - providing completely renewable energy to importing countries via existing LNG export, transport and import infrastructure. Curiously, coal is presently being converted to synthetic natural gas in the most environmentally 'unfriendly' option available - burning a portion of the coal in air to create carbon monoxide and hydrogen that is reacted in a separate step to create methane. This technology has been criticised for its high level of carbon dioxide emissions and water usage. Coal could be converted to methane by reacting it with hydrogen produced by electrolysis of water with electricity from solar PV systems and wind turbines. It can also be converted to methane in high temperature superheated water reactors. The thermal energy to do this can be from concentrated solar thermal energy, or from reaction with hydrogen created by the electrolysis of water. This is most suitable for low-grade lignite such as that found in Yallourn Valley in Australia that consists of 50 percent or more water. 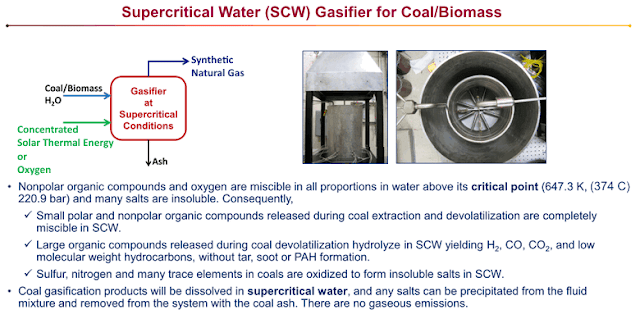 With this process it can be converted to high-value synthetic natural gas, avoiding the need for coal seam gas. Its use can be gradually phased-out as renewable energy generating capacity increases to the stage where it can completely replace it. Renewable energy doesn't get a mention. This oversight is the foundation on which opportunities for Australia's economic development are missed. Two of the energy resources that are included - thermal coal and natural gas - are shown to have outlooks that aren't very promising in the case of coal and are at risk from high domestic production costs and low-cost competition in the case of gas. Thermal coal exports for example are shown to decline in value by $5 billion per year to about $15 billion per year, though volumes are supposed to remain the same. 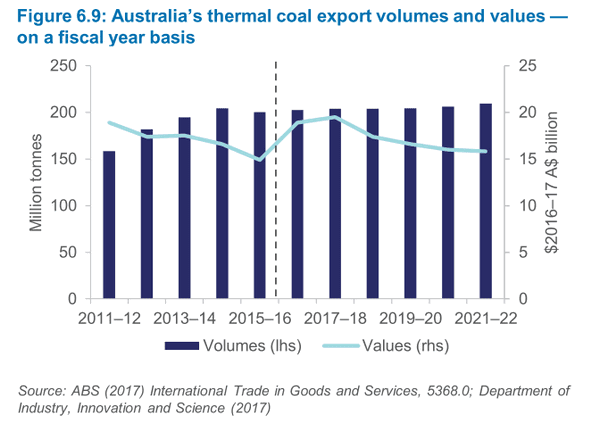 Not all Australian coal mines will be commercially viable with this outlook that is actually describing export prices falling by 25 percent. Natural gas exports as LNG are shown to have a large increase in capacity coming onstream at the same time as an even greater increase in U.S. LNG export capacity - with the U.S. exporters able to source feed gas at much lower prices than Australian exporters. Australia is not immune from supply-side competition. The United States will make the largest contribution to new capacity. The cost competitiveness of US exporters will largely be determined by the cost of their domestic gas, for which the reference price is Henry Hub. Henry Hub prices averaged US$3.0 per million British thermal units over the first quarter of 2017 (A$3.80 a gigajoule). While Australia's LNG exports are projected to rise, the capacity utilisation of Australian LNG export projects is expected to decline. The price competitiveness of Australian producers is one factor affecting the outlook for exports. Proximity to Asia will be an advantage, although the Panama Canal expansion in 2016 has lowered shipping costs from the US. A large cost for Australia's LNG plants is feed gas. The three LNG export terminals on the east coast — which are largely fed by CSG from Queensland’s Surat and Bowen basins — tend to have relatively high costs for feed gas. Unlike LNG ventures using gas from conventional reservoirs, LNG operators on the east coast will need to drill hundreds of new wells each year to maintain CSG production, with costs of over a million dollars per well. Australia has an advantage with ample renewable energy resources to overcome the poor outlook for coal and the high-risk outlook for natural gas. With the price of coal projected to decline to about $2 per gigajoule, and the cost of coal-seam gas likely to exceed the export price of LNG from US exporters, it is increasingly attractive, if not imperative, to export natural gas made from cheap coal and renewable energy. Several processes are available to achieve this. The bottom line is that these processes change 1 gigajoule of coal valued at perhaps $2 into 4 gigajoules of natural gas worth $32 by adding 3 gigajoules of renewable energy.